I work with the homeless here in Calgary, addiction is a word that we hear a lot of, drugs, booze, and gambling are the big three. Often addicts are plagued by other mental health issues, depression, bi-polar, and a variety of other medical terms outside of my realm of knowledge. There have been plenty of books written about addictions, but Confessions Of A Crack Head is different, it is written by the addict, and takes us through the torrid reality of the sickness. Maybe the most disturbing aspect of this book is that there may well not be a happy ending. Zachâ€™s story is a sad one indeed. He is a well educated guy, had a beautiful wife, home, and baby. Then he discovers the demon Crack Cocaine, possibly one of the most addictive substances ever created. Sure Zach is a compulsive, but few people regardless of their mental make up can resist this drug. In the space of an eight month time frame Zach hits detox and rehab 4 times. His, unfortunately is not a unique story, I see Zach on a daily basis, sometimes he is black, sometimes he is white, sometimes he is female, but always he is helpless. As Zach explains, when you do Crack you rapidly become completely out of control, the only thing that matters is where that next hit is coming from. In a two day period he spent $2,500 on the drug. Was it for the ‘high’? No is the simple answer, when using heavy you need to keep it in your system to merely maintain. The withdrawal symptoms are too grim to even contemplate. It did not take long for Zach to crash hard, losing his family, and piece by piece his possessions, and even a place to live. From owning a $500,000 house to picking up butts from the pavement to smoke, in what seemed a blink of an eye. One of the interesting aspects of this book is the peppering of Daily Journal entries. While these only come from the ‘clean’ phase, you get a real understanding of his heartbreak. Time and time again you get a real feel for the problem that an addict faces, he doesn’t ‘use’ because he wants to, in fact often he doesn’t want to, he wishes nothing better than to be able to drive right on by the dealers house. But inevitably he does stop, inevitably he buys as much as he can, and inevitably he cannot stop at one or two hits. After the money in the bank is gone, and all your possessions are just a memory where do you go next? You defraud the bank with fake ATM deposits, you steal money, you kite cheques, you steal, you do anything you can to get that next hit. Zach did all of these and more. As I said earlier, I see Zach everyday, and it is sad. A couple of months ago he visited my Computer Lab, in the mornings I teach, and because I wanted to make some minor changes to a PowerPoint presentation I had left my Laptop and Digital Projector set up. In the blink of an eye, the laptop was gone, they (there were two of them) didn’t even bother to take the power adapter. The machine was password protected, the serial number registered, so it had a very low street value, but enough to get that one more hit. Oh, and this was done under a CCTV system, they were arrested the next day! Confessions Of A CrackÂ Head should be on everyones reading list, for the would be user it should scare you into the next century, for any parent that is worried about son Johnny and drugs, this will give you sleepless nights. Zach, I know that is not your real name, and I know you have moved the locations around to protect the guilty. But I also know your story is a very true and very frightening one. Generally I like to grumble about spelling, grammar, and editing, (of course I hate it when I am on the receiving side) but this is a book written from the heart, and had it been over edited much of the ‘core’ would have been lost. You can pick up your copy from Zach’s website. 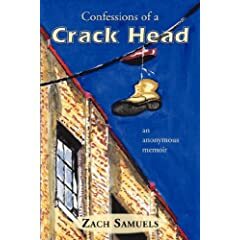 2 users commented in " Book Review: Confessions Of A Crack Head by Zach Samuels "